The main source of income of our society is the membership fee, which contributes to our educational and charitable activities. 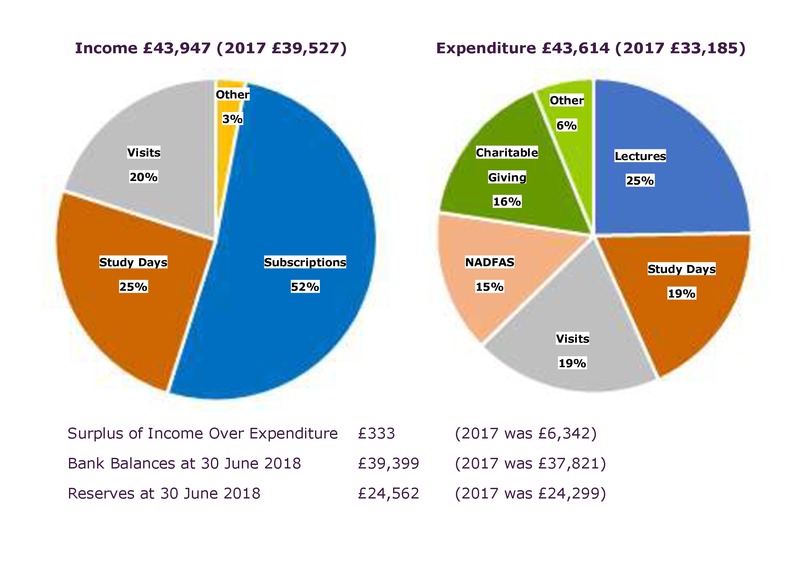 The charts below give an overview of our income for the year ended 30 June 2018 and how it was spent. Our accounts since the society was formed in October 2009 are shown in these pdfs which can be downloaded. Accounts for the year to June 2015: OxDFAS Acs 30.6.15 1, OxDFAS Acs 30.6.15 2, OxDFAS Acs cert. Reserves Policy: The Committee has considered carefully the reserves requirements for the society. Based on an assessment of financial risks and other relevant matters, it considers it appropriate to hold approximately 50% of anticipated annual costs in reserves. This amount will be reviewed on an annual basis.